As I have previously stated in other blogs, I’m not the best at keeping with my goals. I love setting them, but when it comes to crunch time, I’ve usually checked out 3 days prior. So as 2011 nears its end, I have been putting a lot of thought into what my New Years goals might be. I usually go with the old standard goal of “Get in Shape.” You know, cut out sugar and carbs, daily trips to the gym, and that sort of crap. I usually do great with it until, like most Americans, 2 weeks into it and time gets ahead of me and I lose interest. Next up? I know, I’ll organize my house! Clean out everything. From top to bottom. Everyday adding new and more chores to my list. Except, even as I write this, the thought becomes overwhelming with 4 kids, a part-time job, and a house that I, for the most part, maintain by myself. I guess it’s a good thing I got caught up on laundry this morning because now, I don’t want to touch it for days. What’s a super busy mother of 4 in her 30’s to do? Simply, start small. One new-ish thing a day. Yesterday, I tackled a project that I have been putting of for about 2 years. I cleaned and organized my spice and baking cabinet. It felt so good to accomplish something. As small as it may be, it’s done. And it feels great. Today I will try something else small, like cleaning the baseboards in my bathroom. Small yes, but it’s something that gets neglected. Slowly, but surely, tackling things that I’ve been putting off. And of course the “Get in Shape” goal is still on my list. But I have a feeling that as I’m doing a cleanse of my home, my body and soul cleanse will come naturally. 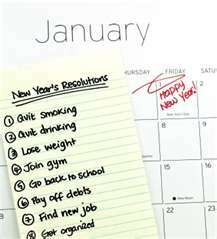 It will also follow my mantra of my New Year’s goal – Start small. Maybe even with a trip to buy a new pair of cross-trainers. Small, but oh, so satisfying! This entry was posted in Family, Fitness, Goals, Holidays, Parenting, Uncategorized and tagged cleaning, goals, jobs, kids, lists, New Years, organize, resolutions, workout. Bookmark the permalink.